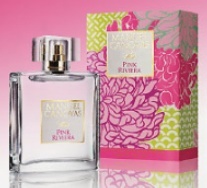 Pink Riviera (shown) ~ inspired by Saint Tropez, with notes of bergamot, citron, grapefruit, mandarin, wild mint, jasmine, rose, sandalwood, white musk and amber. L'ile Bleue ~ inspired by the island of Capri, with notes of bergamot, mandarin, orange, lemon, peach, apricot, rose, sage, patchouli, sandalwood, muguet, white musk, benzoin and amber. Ballade Verte ~ with violet leaves, rose, galbanum, ylang ylang, ginger, sandalwood, cedar, agarwood, Gurjun balsam, tree sap, vanilla and white musk. Route Mandarine ~ inspired by the Orient, and featuring notes of geranium, orange, bergamot, mandarin, clove, citron, cinnamon, ylang ylang, patchouli, rose, muguet, jasmine, orange blossom, sandalwood, vetiver, white musk, vanilla, amber, labdanum, incense, raspberry blossom and civette.